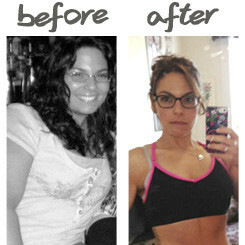 When I did my first Kettlebell Kickboxing Body Series DVDs it was pure excitement! We loved having Dasha, Jenel & the other ladies of KB in our living room! Never had we had so much fun doing an at-home workout! We went through the beginner review and then jumped in to the workouts. The variety made the time fly by – there was no clock watching, as there was constantly something new to distract you from the time. I love these programs, and I love that they all come with a nutrition book that helps me understand, in the simplest and most attainable way possible how to get to my goals weight and keep my results for life. On my journey to health and fitness I lost over 100 pounds. It has not always been easy, but I did it. And mostly I did it by following solid, result proven programs like the Body and Scorcher and 7 Day Lean. You can change your body, and you can change your lifestyle- trust me!